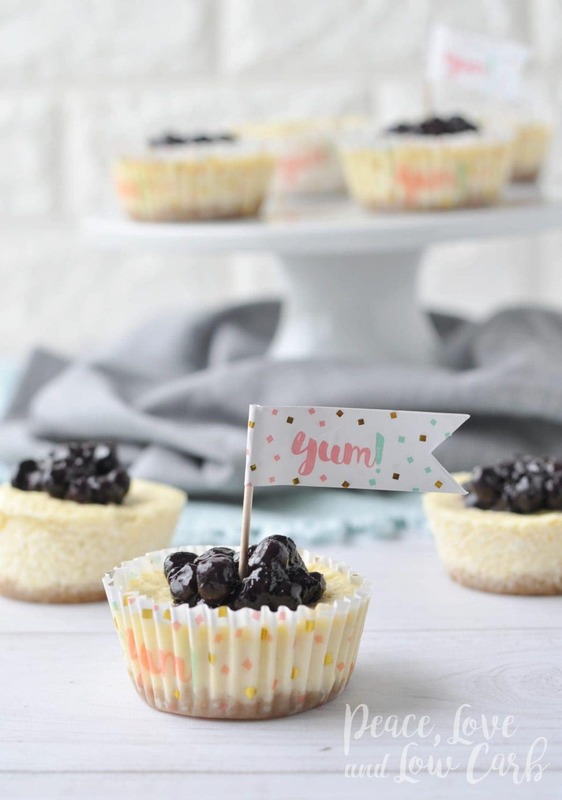 Mini Keto Blueberry Cheesecakes. 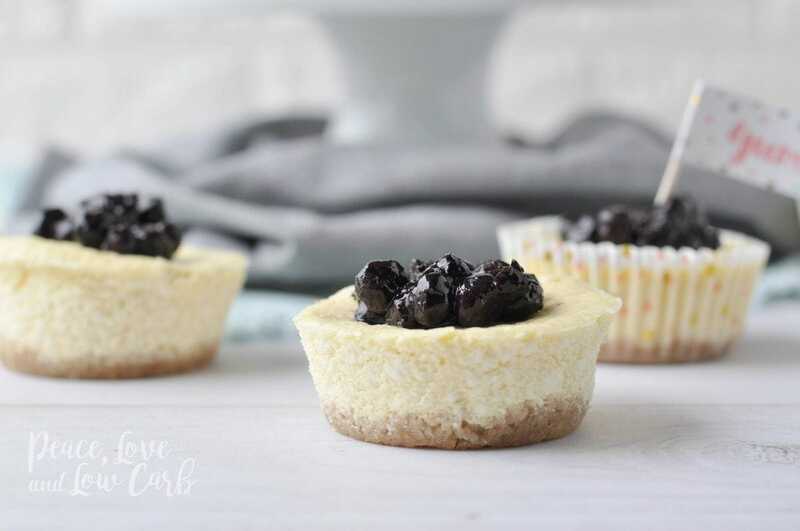 All of the amazing flavor of a low carb cheesecake recipe, in mini, guilt free sizes. This low carb cheesecake is incredibly easy to whip up and will satisfy your sweet tooth and leave you feeling satisfied. 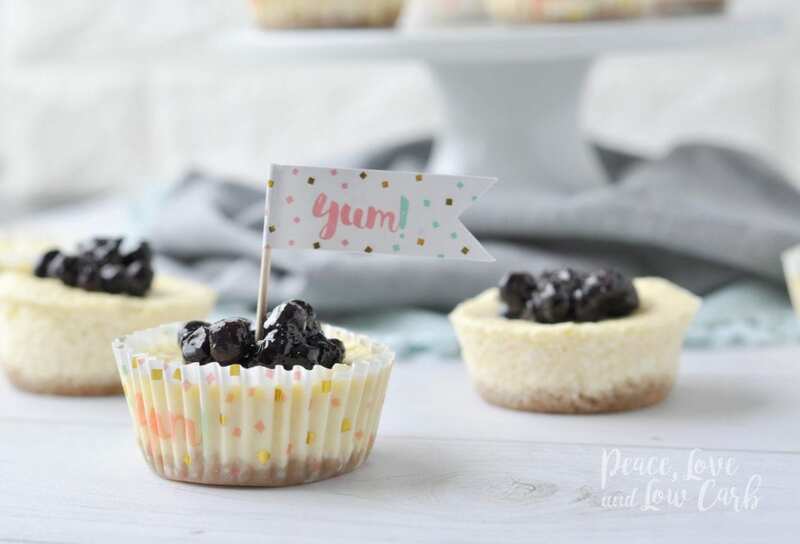 The fact that these Keto Blueberry Cheesecakes are mini sized means it is a lot easier to practice portion control. Well… it’s easier to see what an exact portion is. What you choose to do with that portion size is up to you. Thankfully, the net carb count is low enough that you can probably eat two and still stay within your daily carb allotment. Not sure how many carbs you should be eating in a day? This article might help you figure it out. How Many Carbs Should You Eat in a Day to Lose Weight? Preheat oven to 350° Use a standard size silicone muffin pan, or line a regular muffin pan with muffin liners. In a medium mixing bowl combine the almond flour and the brown sugar erythritol. Add the melted butter to the bowl and mix until the almond flour is coated and is the texture of wet sand. Divide the mixture evenly amongst the 12 wells in the muffin pan. Use a spoon to evenly press the mixture down into the bottom of each muffin liner. In a large mixing bowl, using a hand mixture, beat the cream cheese until fluffy. Add eggs, lemon extract, vanilla extract and Swerve and mix until all ingredients are well combined and smooth. Use a rubber spatula to scrape the sides and mix in. Divide the cheesecake mixture evenly between all 12 wells in the muffin pan. If using a silicone muffin pan, place it on top of a baking sheet. Bake for 25 -30 minutes or until the cheesecakes are set. They will still be a little jiggly in the center. While the cheesecakes are cooling, heat a small sauce pan over medium-low heat and add the blueberries. Let the blueberries simmer for 15 minutes. Mash them slightly to release their juices and let the juices thicken. 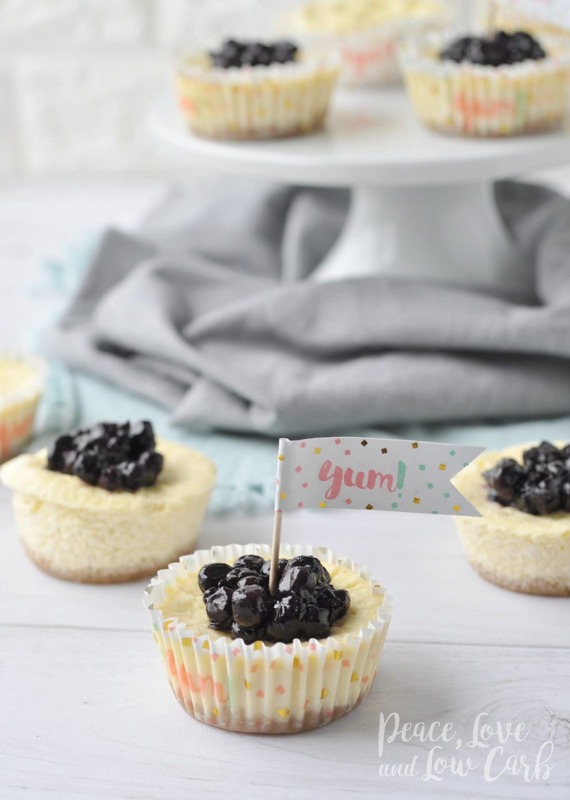 Divide blueberries evenly among the cheesecakes. These are fantastic cheesecake bites. The flavour is light and refreshing due to the lemon extract but married with the vanilla gives it a delightful palette. These are definitely on my make again list. You won’t be disappointed. Awesome! So happy you enjoyed them! I may be missing something, but you say “mini” cheesecake bites, but it calls for a “regular” size muffin pan. Is it actually a regular size muffin? I can’t wait to try these! It doesn’t say mini cheesecake bites, it says mini cheesecakes. Because it is not one large cheesecake cut into slices, but rather 12 individual mini cheesecakes. These came out great! I used less sweetner (6T instead of the 1/2 cup in the cheesecake) per my own preference and almond extract instead of lemon. Even my sister who is gluten free and not fond of sugar free enjoyed these. I will be making them again for sure! Even the crust is yummy! For real!? Keto friendly cheesecake!? These are a game changer, for real. I’m in love! I’ve made these twice now. Love these little cheesecakes for dessert while on the keto diet. These are great. I didn’t put the sweetener in the almond crust, preferring to add cinnamon to it instead, and used less sugar in the batter (honestly, I ran out of sweetener). It worked great! These were the perfect size to bring to work and share, Everyone loved them. Thanks for all you recipes! 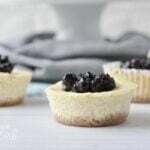 I’m trying these mini cheesecakes today. Do you know of a way I can easily import the recipes into MyFitnessPal? When I try to import via the recipe URL option, it always tells me it can’t recognize the recipes on your recipe pages (i.e., I get a “No Recipes Found” error message). So, I end up copying and pasting the recipe into MyFitnessPal using the manual recipe option, but then the fantastic photo of the food doesn’t appear next to the recipe (which helps me differentiate my many keto recipes from each other). Any hints would be appreciated. If not, no worries. Thanks! Loved these. Being a Keto Momma who has a sweet tooth.these rocked!!! Plus looking to make some cool 4th of July sweets and came upon your recipe. This one is a winner!! Im bringing these and im hunting for a few other yummy treats to make and bring to the BBQ. The hubby and kids liked them too!!! Very simple to make. These are simply amazing. My whole family loves them, even the non-keto ones.